I have a 9 year old daughter * gasp * can that be? She is the sweetest thing around. I adore her. She starts 4th grade this year. She'll learn about Idaho history - the Oregon trail, Lewis & Clark and awesome Sacajawea who saved their tails a few times. And of course our famous potatoes, can't forget those Idaho potatoes. But I digress. 4th grade is awesome. But it's also where she will slowly start to leave her childhood. I hope she always knows she is hilarious, talented and beautiful. How do I teach her this as she grows? How do I teach her to always see the beauty in herself and others? 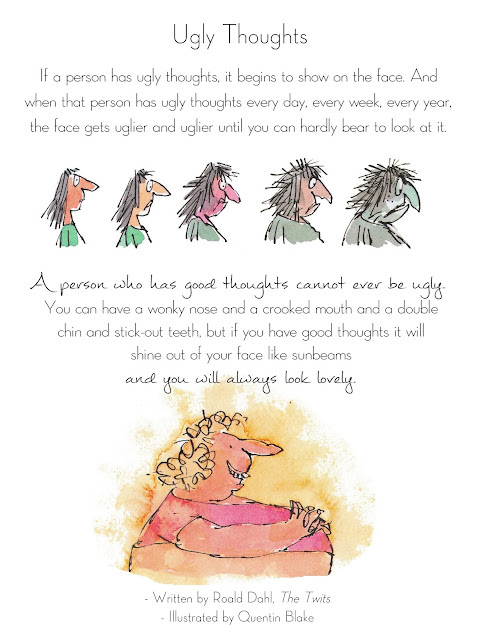 I found this quote from one of Roald Dahl's books, I especially love the drawings. I'm going to hang this in the bathroom, so when my 9 year old gets ready for the day she remembers to also prepare her mind for the day. I need a copy in my bathroom too.